In recent weeks we have been seeing an increasing number of works by the artist calling himself HOGRE. A mystery artist who we have not yet had the pleasure of meeting and with no instagram that we know of a rare thing these days we have managed to track down a HOGRE Facebook page featuring some additional works from the artist. HOGRE is possibly better known to some for his smaller stencil works some of which are still visible around Hackney Wick including this one pictured below. 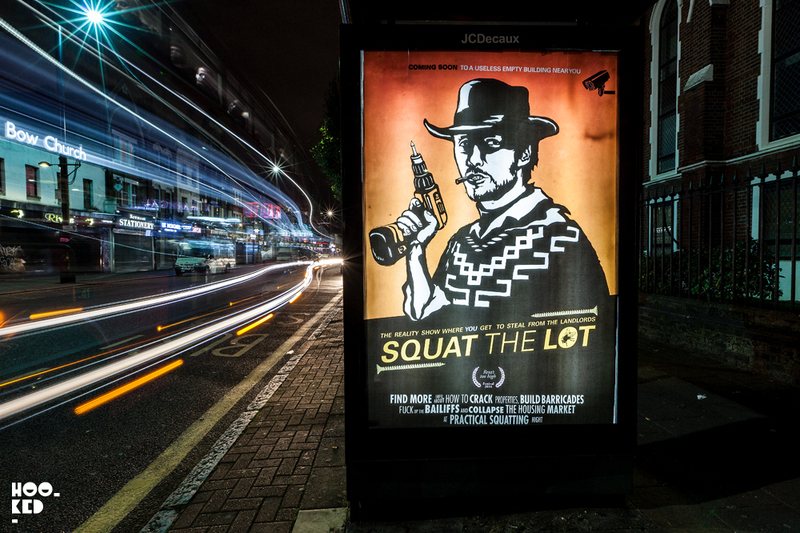 We have been fortunate to spot some of the artists recent works on our travels which has seen him illegally installing a series of posters into the London Bus Advertising shelters, opening up the advertising spaces and replacing the existing advertisements with his alternative posters. 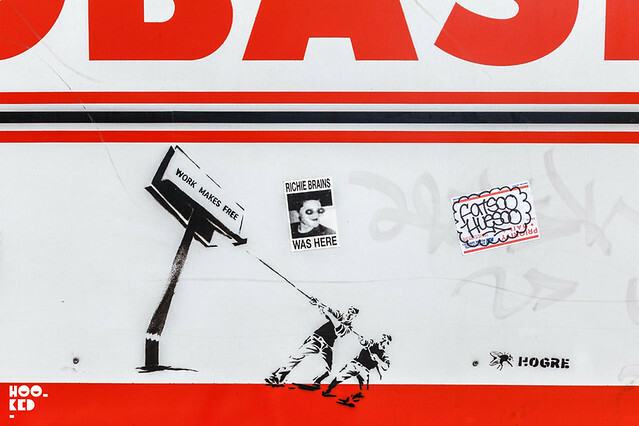 Due to the nature of these works and how frequently these commercial posters are changed by the media companies these works often disappear before we get to see them in person let alone capture them on camera so to catch not one but three on our travels this week was a result. One of HOGRE's stencil works in Hackney Wick. The first of the three works featured what at first glance looks like an advert for the U.K.'s second largest chain of supermarkets Sainsbury's. 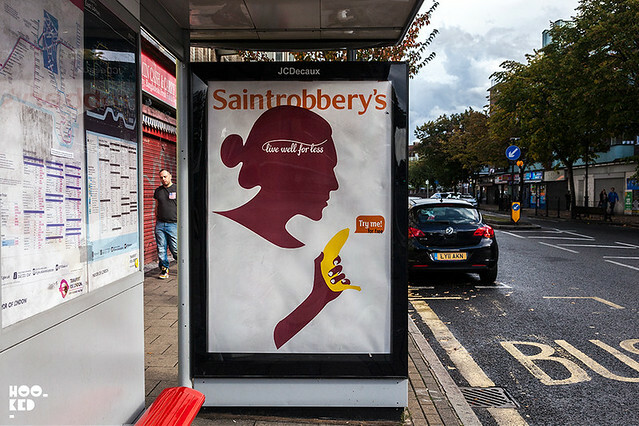 The brand colours and messaging style is all very similar but if you stop and happen to notice the advert you will see that the artist has altered the messaging replacing Sainbury's with Saintrobbery's along with the tag line 'live well for less, Try It For Free'. The other two poster works (both pictured, one up top) we spotted by the artist are part of a series with matching colours, messaging and styles, looking like they are part of a campaign for a new movie. 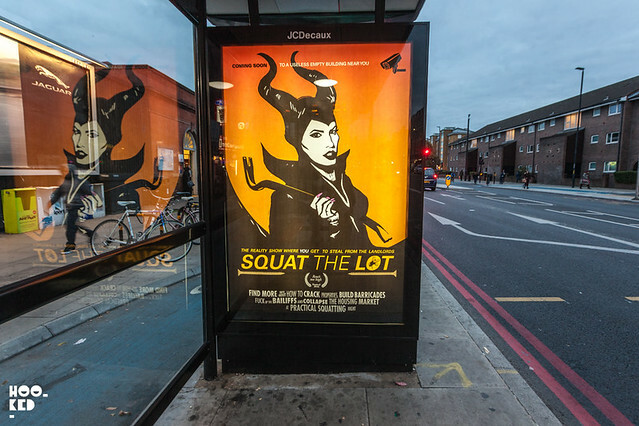 But again if you stop and take note you will see that these posters are not advertising a Hollywood flopbuster but a 'Reality Show Where You Get To Steal From The Landlords' called what else but 'SQUAT THE LOT' which according to the posters is 'Coming soon to a useless empty building near you'. All three posters were spotted in different locations across East London and there are possibly more out there that we have yet to see. If anyone has seen any of his works let us know below in the comments section.